Britain's Prime Minister Theresa May addresses a news conference during an European Union leaders summit in Brussels, Belgium, October 20, 2017. It was the second time in six months that a correspondent for Germany’s Frankfurter Allgemeine Zeitung, who is respected for his access to Juncker’s entourage, has published an account of the EU chief executive’s reactions after a dinner meeting with the British prime minister on Britain’s EU withdrawal. 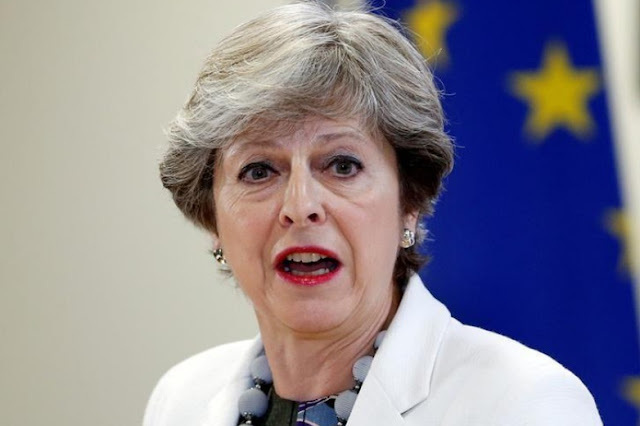 Sunday’s story, which painted an unflattering picture of a British leader worn down by party in-fighting and “pleading” for help from the EU, sparked a Twitter spat between aides past and present to May and Juncker. After a summit last week at which EU leaders sought to build trust with May to try to speed up Brexit talks, Juncker’s chief-of-staff denied an accusation leveled on Twitter by his former British counterpart in May’s team that he was the source of the story -- as many suggested he was after a dinner in London in April. Martin Selmayr called the FAZ story an attempt to “frame” him and to sour relations between Juncker and May. Commission spokesman Margaritis Schinas told reporters: ”Some people like to point at us to serve their own political agendas ... or even to undermine our own negotiating position. We would appreciate if these people would leave us alone. He declined to say who might wish the Commission ill but added that Juncker would “never have said something like this”. London was irritated that after a Downing Street dinner in April, the FAZ said Juncker told aides that he thought May was “in another galaxy” with her demands for EU favours from the European Union after Britain leaves in 2019. At the time, EU officials did not repudiate the main thrust of the report. Selmayr snapped back saying that neither he nor Juncker made the reported comments. “I deny that 1/we leaked this; 2/Juncker ever said this; 3/we are punitive on Brexit,” he wrote. ”It’s an attempt 2 frame EU side & 2 undermine talks ... This is false. I know it doesn’t fit your cliché, @NickJTimothy. But @JunckerEU & I have no interest in weakening PM. Sunday’s report was by the same journalist whose story on April’s dinner was dismissed by May at the time as “Brussels gossip”. EU officials did not deny the accuracy of that account of the earlier meeting. Officials on both sides said it did little to foster an atmosphere of trust needed to reach a deal and which prompted reports that German Chancellor Angela Merkel was also irritated by the leak for the same reason. On Friday, EU leaders moved to speed up talks and spoke of opening a new phase in December. Some said they understood May’s difficulties in forging consensus in London.